Indeed, "Why are we doing this?" America's prime example of horrific, wrongful policy, the Guantanamo detention facility, is back in the headlines as many of those detained and held indefinitely, have staged a hunger strike that began in February. This has caused President Obama to say of the facility, "It's not sustainable. The notion that we're going to keep 100 individuals in no man's land in perpetuity made no sense. All of us should reflect on why exactly are we doing this? Why are we doing this? Indeed, why are we doing this! 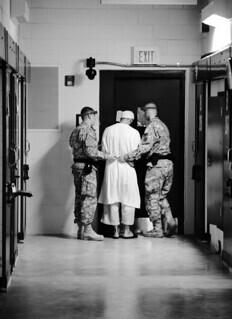 Initiated by the Bush administration as part of its "war on terror" the facility is a direct affront to due process, by holding suspects indefinitely without charges until the "end of hostilities", a fig leaf of extra-legal cover that has kept these men locked away some since 2001. One of the detainees, Moath Hamza Ahmed al-Alwi from Yemen, who has not eaten in 80 days put it succinctly, "I don't want to kill myself. My religion prohibits suicide. But I will not eat or drink until I die, if necessary, to protest the injustice of this place. We want to get out of this place. It is though this government wishes to smother us in this injustice, to kill us slowly here indirectly, without trying us or executing us." Alwi is being force-fed twice a day after being tied to a restraint chair. In a further affront to these men, a "Military Policy Directive" states, "In the case of a hunger strike, attempted suicide or other attempted serious self harm, medical treatment or intervention may be directed without the consent of the detainee". However, the president of the American Medical Association, Dr. Jeremy A. Lazarus, in a letter to Secretary of Defense Chuck Hagel put it this way, "Any doctor who participated in forcing a prisoner to eat against his will was violating core ethical values of the medical profession. Every competent patient has the right to refuse nourishment, including life sustaining intervention." Iran Offers 9 Point Plan to end Nuclear Crisis, U.S. "No thanks".